Gianfranco Intra participated in the Eurovision Song Contest once, being the arranger and conductor of the Italian entry to the 1961 festival, ‘Al di là’. It was performed by Betty Curtis. Prior to this contest, held in Cannes (France), Intra had been one of two musical directors of that same year’s Sanremo Festival in Italy, where ‘Al di là’ was chosen as the winning song. In the Eurovision Song Contest, Betty Curtis finished fifth amongst sixteen contestants. For eight years, Gianfranco Intra studied the piano. Moreover, he successfully finished the conducting course at the Milan Conservatory. Although he had been the piano player in an amateur orchestra at age fifteen, he effectively started his career as a professional musician in 1951, when he joined the Menestrelli del Jazz, replacing pianist Giampiero Boneschi. Amongst the other group members were Fausto Papetti (saxophone) and Ezio Leoni (accordion). 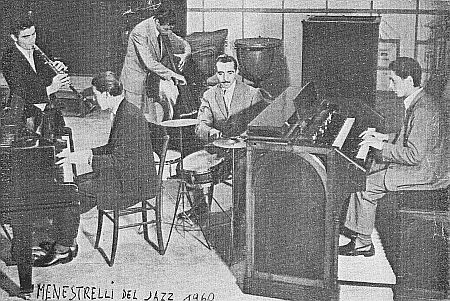 The Menestrelli del Jazz earned themselves a record deal with the Music label of Swiss producer Walter Guertler and toured Italy with considerable success. Intra left the Menestrelli in 1960. Already during the 1950s, Intra developed a penchant for working in the studio. From the mid-1950s onwards, he recorded instrumental pieces, which were released under his own name; these include the piano track ‘Ebb tide’, published on the Durium label in 1954, as well as some jazz records with small ensembles led by Intra himself. In the late 1950s, he formed a duo pianistico with his younger brother Enrico (1935-), with whom he made studio recordings and performed on stage – most prominently at the 1959 edition of the Sanremo Festival, where the brothers presented themselves with a piano potpourri of all songs which had reached the final of the competition. Just like Gianfranco, Enrico Intra went on to become a successful arranger for popular Italian singers in the 1960s, regularly appearing as a conductor in the Sanremo Festival. Later, Enrico was one of Italy’s most sought-after jazz pianists and became a teacher at the Civica Scuola di Musica, Milan. 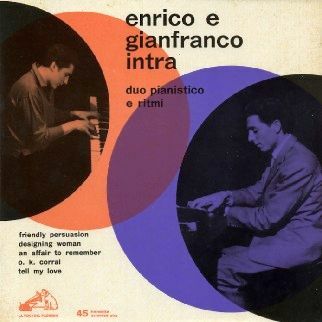 In 1957, Gianfranco Intra joined RAI, Italy’s public broadcasting company, as a pianist and served in the orchestras of successful maestros Cinico Angelini and William Galassini. 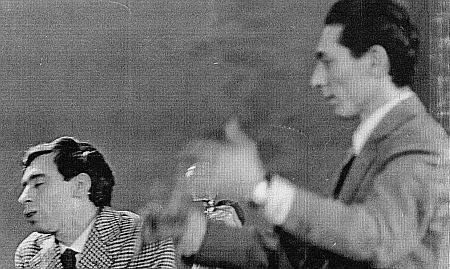 Later onwards, he became a radio and television conductor himself, working with well-known presenters such as Pippo Baudo and Mike Bongiorno. Intra participated in many radio and television programmes which were recorded in the Milanese RAI studios, including ‘Studio L chiama X’, a long-running radio show with a live orchestra, presented by Mike Bongiorno. In 1961, together with Bruno Canfora, Intra was the musical director of the Sanremo Festival, arranging half of the songs presented and conducting his orchestra of thirty-three musicians during the live show. Intra continued to work for RAI on a regular basis until 1986, one of the highlights being the radio concert with the Paolo Orlandi Quartet and his own Orchestra Ritmica di Milano della RAI in ’77. In the 1960s, Gianfranco Intra was one of Italy’s single-most sought-after arrangers and conductors in the recording studio. He was the artistic director for several Milan-based record labels, such as Fonit, La Voce del Padrone, and Philips. Songs with his arrangements were recorded by many different artists from Italy and abroad, including Orietta Berti, Patty Pravo, Milva, Fausto Leali, Claudio Villa, Nuccia Bongiovanni, Giuliano e i Notturni, and Henry Wright. Intra’s trademark was the abundant use of strings in his orchestrations. Occasionally, Intra composed songs himself, amongst others for Umberto Bindi. The 1969 Sanremo success ‘Un’ora fa’ (performed by both Fausto Leali and Tony Del Monaco) was written by Intra as well in collaboration with lyricists Luciano Beretta and Ermanno Parazzini. For that same Sanremo edition, he submitted two more songs, a samba called ‘Dove andranno le nuvole’ and the more rock-orientated ‘E mi trovo a parlare con te’; both songs, however, were rejected by the selection committee, but were later successfully recorded by other artists – the former composition by Mario Zelinotti, who participated in the popular TV contest Disco per l’Estate with it in 1970. His version of ‘Dove andranno le nuvole’ went on to become a major hit in both Italy and Spain that same year. On top of all this, Intra made his mark as a composer of advertisement jingles as well as film soundtracks, most prominently that of ‘Un uomo da bruciare’ (1962). In the 1960s, Gianfranco Intra regularly arranged and conducted songs which participated in the Sanremo Festival. Intra appeared as a conductor in all editions of this important song festival between 1964 and 1970, leading the orchestra for multiple songs. Most prominently, he conducted ‘Je suis à toi’, which, sung by French Patricia Carli, was the first prize winner of the 1964 Sanremo Festival; the other version of this song, ‘Non ho l’età’, was performed by Gigliola Cinquetti, who won the Eurovision Song Contest of that same year with it. Other artists for whom Intra conducted the Sanremo orchestra, include Gene Pitney (‘Amici miei’, ‘Quando vedrai la mia ragazza’), The Fraternity Brothers (‘Sabato sera’, ‘La prima che incontro’), Yukari Ito (‘L’amore ha i tuoi occhi’), Bobby Ridell (‘Un bacio piccolissimo’), Les Surf (‘Si vedrà’), Connie Francis (‘Ho bisogno di vederti’), and Audrey (‘Prima o poi’). In the 1980s, Intra continued to work in the recording studio. He arranged and produced the EP ‘A L’ for French singer Amanda Lear in 1985. One year later, he left RAI to join the commercial Mediaset network, for which he collaborated on several TV shows; these included the nostalgic contest ‘C’era una volta il festival’, in which former participants of Sanremo and other Italian music festival competed against each other, performing their original song accompanied by Intra’s orchestra consisting of thirty-two musicians. This show, which was broadcast by Canale 5, ran for two seasons (1989-’90) and was presented by Mike Bongiorno. Winners were Bobby Solo with ‘Una lacrima sul viso’ (1989) and Camaleonti with ‘Perché ti amo’ (1990). As mentioned in the above, Gianfranco Intra was one of the musical directors of the 1961 Sanremo Festival. In those years, it went without saying that the winning song of that competition would be the Italian representative in the Pan-European version of Sanremo, the Eurovision Song Contest. 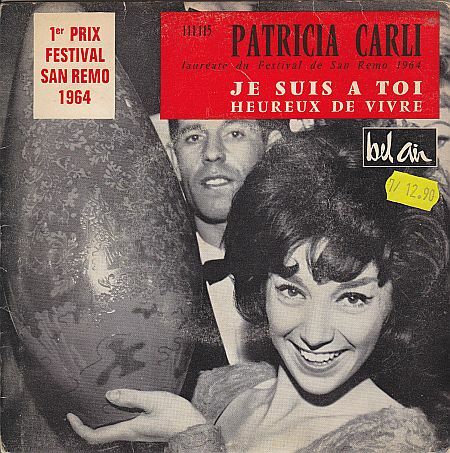 The 1961 edition was won by the emotional ballad ‘Al di là’, performed by Betty Curtis (with Intra’s orchestra) and Luciano Tajoli (with the smaller ensemble of Bruno Canfora). In the end, Intra’s version with urlatrice Curtis was preferred to the more classically orientated voice of Tajoli to represent Italy in Cannes. In the 1961 Sanremo Festival, all songs were performed in two versions by the two different orchestras and with different vocalists. Both Canfora and Intra wrote all arrangements themselves. Moreover, Intra recorded the studio versions of all of the songs that had been trusted to him, in the Fonit Studios in Milan. For the live show, he took his group of thirty-three session musicians with him to Sanremo. At that time, it was the largest orchestra in the history of the festival, which had first been organised in 1951. As the arranger of Betty Curtis’ version of ‘Al di là’ and the musical director of the 1961 Sanremo Festival, Gianfranco Intra was the natural choice to be the conductor of the Italian delegation in that year’s Eurovision Song Contest in Cannes, France. Intra remembers the rehearsals with Franck Pourcel’s orchestra in Cannes well: “After we had rehearsed my arrangement of ‘Al di là’ with the French orchestra and Betty Curtis, the first violinist invited the whole string section to hit the top of their music stands with their bows as a recognition for, what they thought, was a good and functional arrangement. It goes without saying that I took great pride in that.” In spite of its role as a favourite, the Italian song managed to score no more than twelve points and a slightly disappointing fifth place in a field of entries from sixteen competing countries. Nevertheless, Betty Curtis had an international hit with the song, which was later covered by countless artists in many different countries. So far, it has not been possible to gather memories of other artists who worked with Gianfranco Intra. 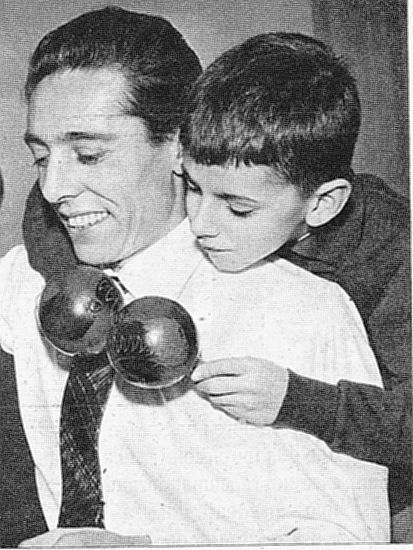 Thanks to Gianfranco’s daughter Anita and his brother Enrico Intra for providing us with information about his career, amongst which some newspaper articles and photos. Thanks to Italian music expert Eddy Anselmi for providing us with some important information regarding the history of the Sanremo Festival. A book offering a chronological survey of the history of the Sanremo Festival: Adriano Aragozzini, “Enciclopedia del Festival di Sanremo. Quarant’anni di Musica e Costume”, Milan 1990 (ed. Rusconi). Another highly informative book on the Sanremo Festival: Dario Salvatori, “Sanremo50. La vicenda e i protagonisti di mezzo secolo di Festival della Canzone”, Rome 2000 (ed. RAI). Unfortunately, no website on Gianfranco Intra exists.